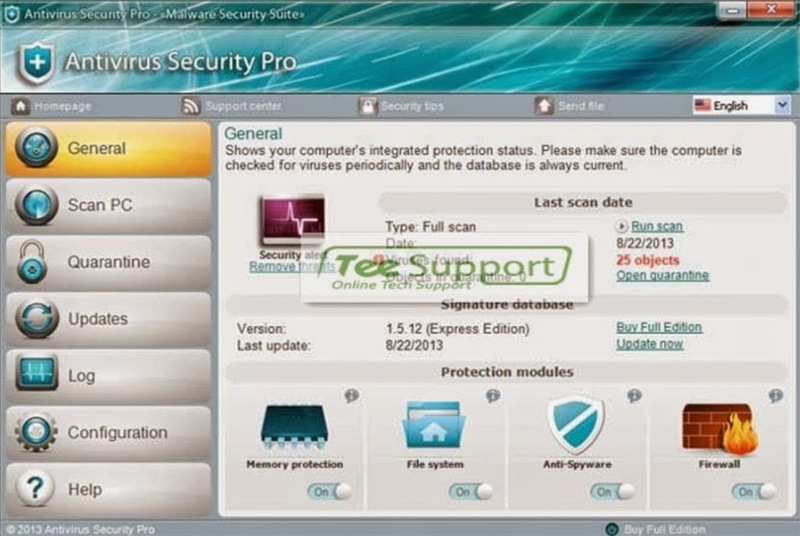 AntivirusSecurity Pro is another piece of MultiRogue 2013 which is designed and developed to fool average computer users into purchasing the license key of Antivirus Security Pro - the bogus software. By bombarding the infected system with multiple fake security warnings, the rogue tried every shift available to convince users of a severely contaminated machine. You may be warned here and there that the computer is infected with high risk malware, it even states your Chrome.exe, or eplorer.exe is infected with a risky Trojan. Besides, fake Antivirus Security Pro Firewall alert or similar alert comes up when you try to open a program. There are also numerous occasions that it generates an automatic system scan and reports multiple threats in the wake of the scan. What's more, It makes operating system registry modification to make the computer unusable. It then trumpets that the activation of Antivirus Security Pro is able to get all fixed. It's believed to be a waste of money to pay for a worthless full version which is created with no virus dictionary and in a position to fixing nothing. Other than any infection displayed by Antivirus Security Pro, the scam is the only threats you need to remove, the sooner the better. What Does Antivirus Security Pro Do? Slips into the system without explicit user consent. Generates plenty of non-existent infections and system errors. Launches pestering ads which links to suspicious sites. Changes security settings to make the PC prone to other malicious programs. Redirects search queries to multiple ads pages. Causes frequent and unexpected blue screen of death. Step 1: Restart the infected computer into safe mode with networking by pressing and holding F8 before Windows launches. Notes: Be aware that the rogue malware may drop different files or registry entries with different names in different infected system, so be careful when you are trying to figure out the manual Antivirus Security Pro removal yourself. However, if you are still confused with above Antivirus Security Pro removal procedures, or you prefer effective and faster professional assistance, please click here to contact a 24/7 online expert for more details.